It’s about that time, of that day of the week. I refer, ladies and gentlemen, to the hallowed tradition of imbibing alcoholic beverages at day end on a Friday (well, in the Western world, at any rate). All over New Zealand, people are happily clutching (or soon to be clutching) flagons of beer, pitchers of wine, and schooners of cocktails. And it is the last to which I shall devote this post, having previously spoken of beer (with wine no doubt soon to come). I have no research in particular to share, but rather a picture, some wisdom, and a reference for where to go for something quite special. First, the picture. Or, to be more precise, schematic. And who couldn’t find themselves falling instantly in love with this splendidly elegant alcoholic jaunt? Not me, dear readers, not me. Right, moving on! 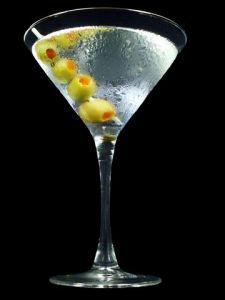 From the fantastic science blog Cosmic Variance, what can only be described as a treatise on what does, and does not, constitute a real martini. It changed my martini habits for the better, and will most certainly yours as well. If nothing else, it’s fun terrifying bartenders by being, you know, discerning (and traditional) about this drink. Finally, a reference. For those who like cocktails, there are two lovely spots in Wellington. The Library and Chow, on Courtney Place and Tory street respectively (and sharing an interleading door). Very different spots with very different feels, but both are highly recommended. The earl grey martini a friend introduced to me (made at Chow) is a wonder to behold, and even better to actually drink. And with that – happy Friday to all, and to all a fun night!